Solar installations are becoming a no-brainer for anyone with a roof in much of the country. But getting an estimate on how much it would cost and how much juice it would generate can be complicated and time consuming. Aurora Solar has made an automated process for doing this, and attracted $20 million in funding as a result. A big part of the uncertainty anyone has about getting solar installed is the upfront cost and return on investment. An on-site visit may cost hundreds, or thousands for a commercial property, or that cost may be rolled up into the overall charge. But why send someone out when all the data you need can be acquired in bulk from the air? Aurora uses lidar data for this — but not the kind of lidar where you have to fly a drone with the instrument over the house. That would hardly be less expensive and time-consuming than a normal visit. Instead they use lidar collected by small aircraft making low-altitude passes over the city. The resulting data (you can see it above) produces detailed 3D models of the terrain and all the buildings on it; the exact size and slope of a roof can be determined with high precision. It’s actually similar in a way to how archaeologists used it to map out an ancient Mayan metropolis. There are some programs and services out there that do virtual site visits, but many just estimate your roof area and orientation by looking at satellite imagery. 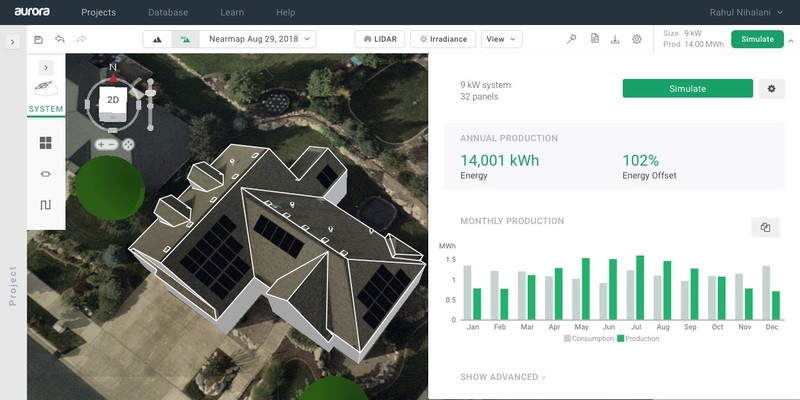 That’s good for a basic estimate, but Aurora uses multiple sources of data to create a detailed 3D map of your roof, and its proud of its results. “From the get go, we have been very ambitious about the way we address the problem, probably since we faced same issues our clients face ourselves,” said co-founder Christopher Hopper in an email to TechCrunch. That would have been in 2012, when he and co-founder Samuel Adeyemo experienced significant friction with a solar install in East Africa. The installation itself was a snap, they found, but the planning and design of the system took months. From there users can go straight into the sales and financing process, even including line diagrams for the electrical system you’ll be building. And theoretically it could all take under an hour, which is probably how much time you’d spend on the phone trying to get a local solar installer to come out. The A round was led by Energize Ventures, whose managing director Amy Francetic will be joining the board, with S28 and seed investor Pear also contributing. Once nice thing about companies relying on data and automation: they scale well. So Aurora won’t need to buy a thousand new trucks to get its next few thousand customers — it needs to hire engineers, sales and support people, which is exactly what it plans to do. Adeyemo notes in the press release announcing the funding that “the solar professional” is the “fastest growing occupation in the U.S.” Hopefully making things easier for the customer will keep it that way for a while. Disclosure: Former TechCruncher Rahul Nihalani now works for Aurora. Rahul’s great, but this does not affect our coverage.